Surrounded by low rise buildings and shop houses, a gentle breeze and the entire view of the Tiong Bahru neighbourhood is sure to greet you as you dine in at Lin Rooftop Bar. 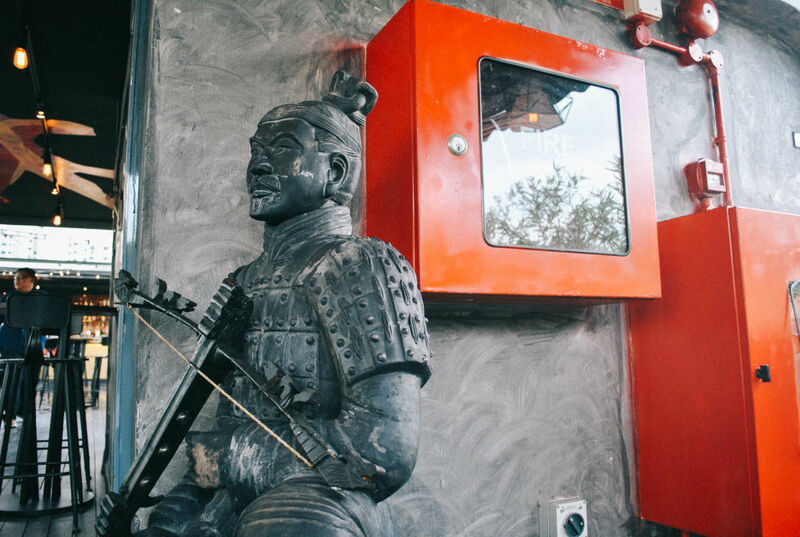 It sits on top of Link Hotel along 50 Tiong Bahru Road, and can be identified by its bamboo stalk partitions as well as terracotta warriors flanking the bar entrance. Comfortable and welcoming, Lin (short for shu lin – forest in Mandarin) receives a steady flow of traffic from tourists and locals alike. 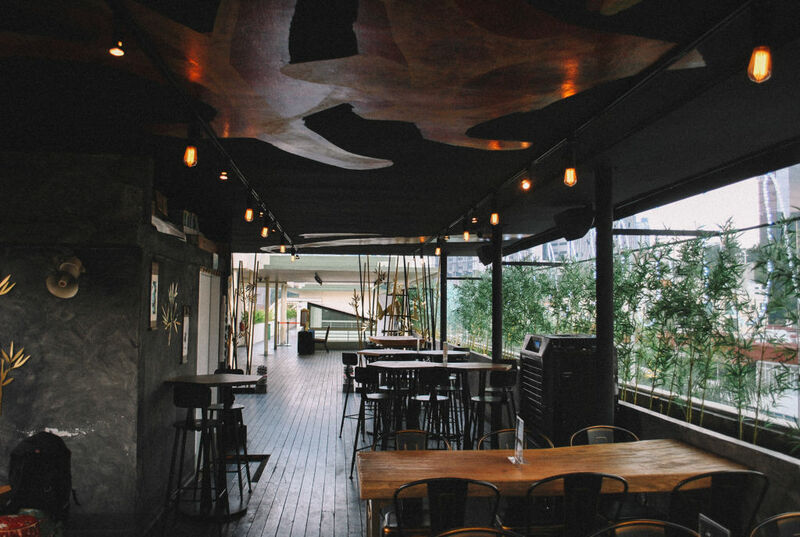 After all, it is the first rooftop bar of Tiong Bahru and boasting a semi-alfresco space with ceramic Chinese stools as well as modern dining furniture. Six months in and deciding to spice things up, Lin has a new menu with dishes that fuse both western and eastern tastes while promising bigger food portions. Think otak-otaks, coconut cream served with chilli as well as sotong balls. 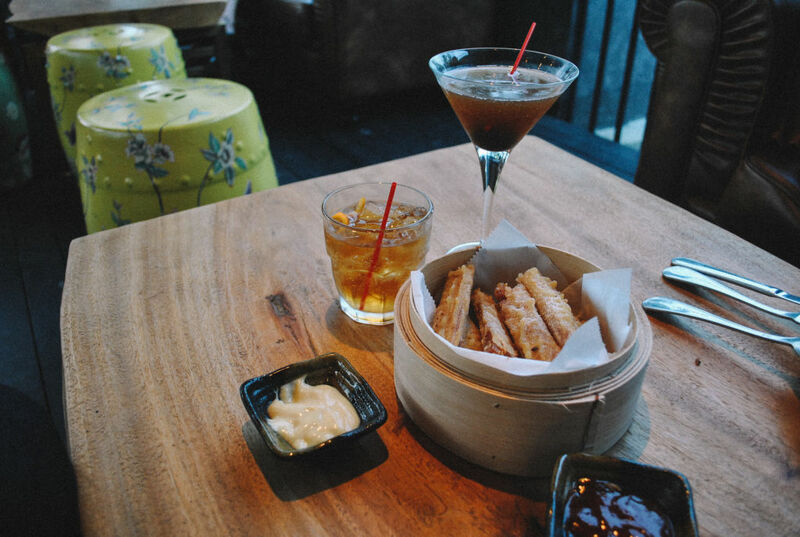 Though bars around town barely serve local foods to go with alcohol, this changed up menu is an invitation to everyone that maybe this is the best combination for a late night out. We must say that they were not kidding about being generous with the servings. However, after tasting only three appetisers and two mains, we are convinced that we might just keep coming back for more. First up, we had Blur Sotong – homemade breaded sotong balls with a cheesy centre. 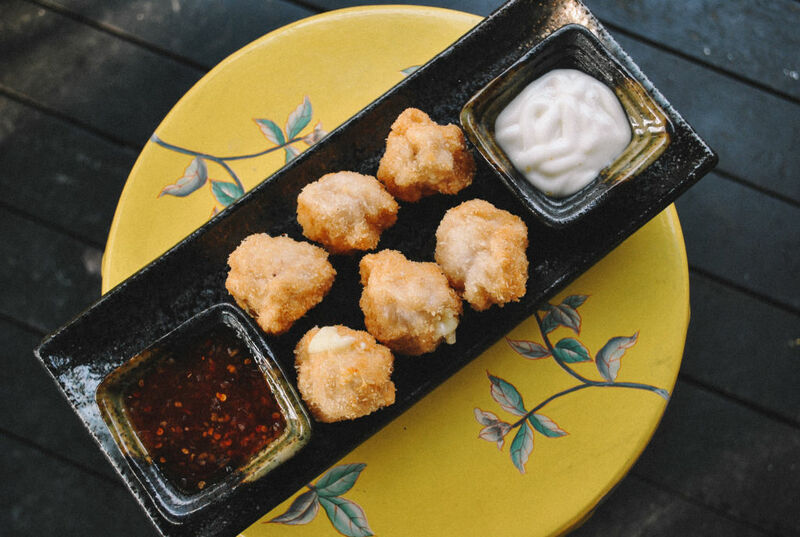 Each serving is paired with Thai chilli sauce and their own secret mix of mayonnaise. The texture is chewy and the taste subtle; not overwhelmingly fishy. Having cheese at the centre is a delight to the tastebuds because it brings about a slight creaminess after the first bite. Each sauce adds on to the flavour of the sotong ball as well, and does not overpower the dish. It is a great Asian Tapas to have, with condiments or just on its own. Yin Yang was next to arrive and looking as photogenic as ever. 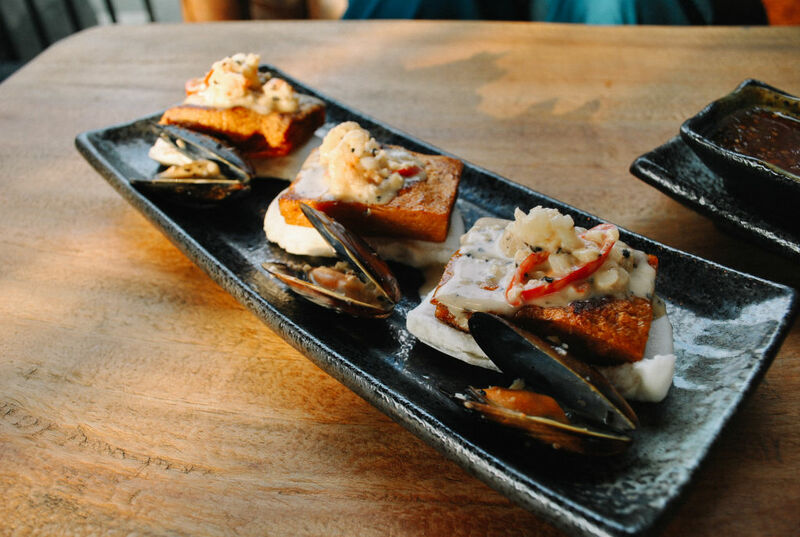 Just look at the lined up mussels, homemade otaks and a layer of Chinese buns. Each otak and bun combination is topped with chilli, coconut cream and prawn bits. They are not thin like the ones found in pasar malams, but made thick – all the better to taste the cooked fish puree that was thoroughly smooth and evenly cooked. The topping of sweetness and spice made this dish even more memorable, and more edible for people with a lower tolerance for spicy food. A re-invention of spam fries, Lin’s Dynasty is basically breaded and fried luncheon meat with cheese. Served with icing sugar topping, we must say that this came as a surprise. The subtle sweetness of the icing sugar went very well with the deep-fried coating. 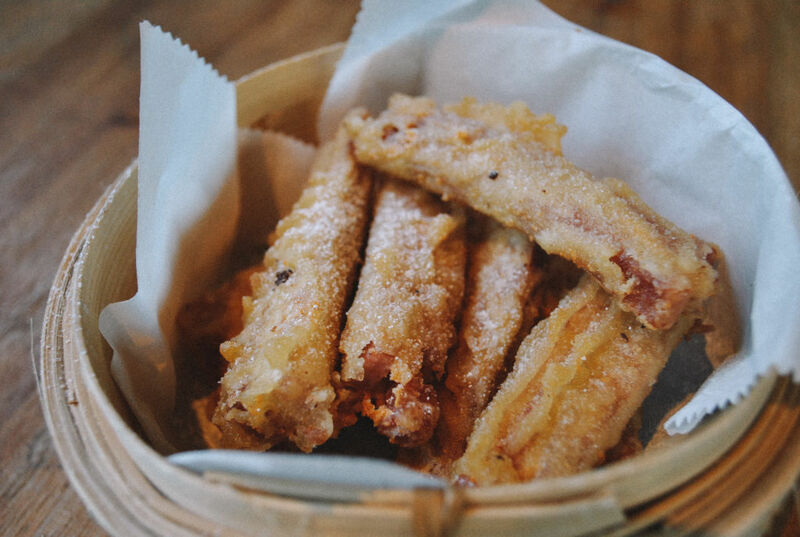 It reminded us of churros, in some ways, but this is the meatier version. However, as the warmth of the dish weared out, it can get a bit dry and too hard to chew. Typical bar grub, this would be a go-to snack while you are having a beer. Otherwise, we might choose to give this a miss. Aptly named the Juicy Lucy Beef Burger, it is a 180g well-marinated patty and definitely aimed to please your hunger. Easy to chew and juicy on its own, the burger needs no sauce to be tasty but just cheese, caramelised onions and greens for added taste while bacon is for the extra crunch. It is served with fries and coleslaw. 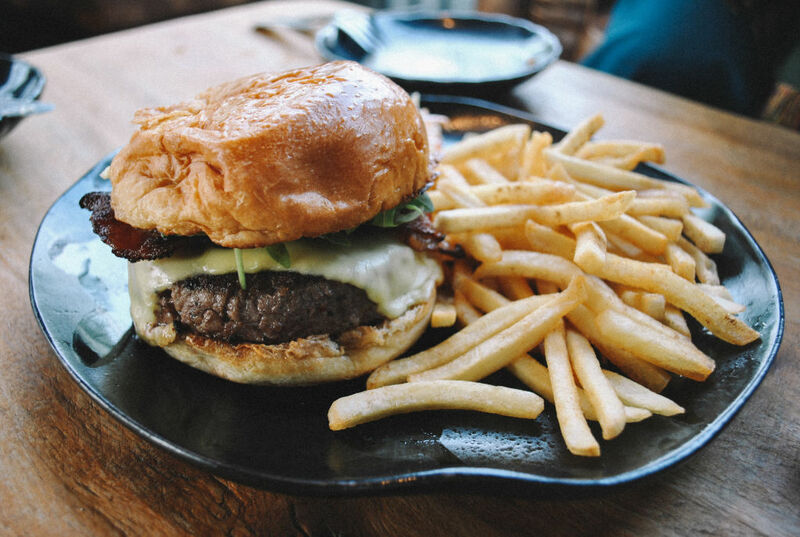 Even though the burger and fries combination can be easily found almost everywhere, this Lucy might just be the first girl we call up when we need a quick fix. 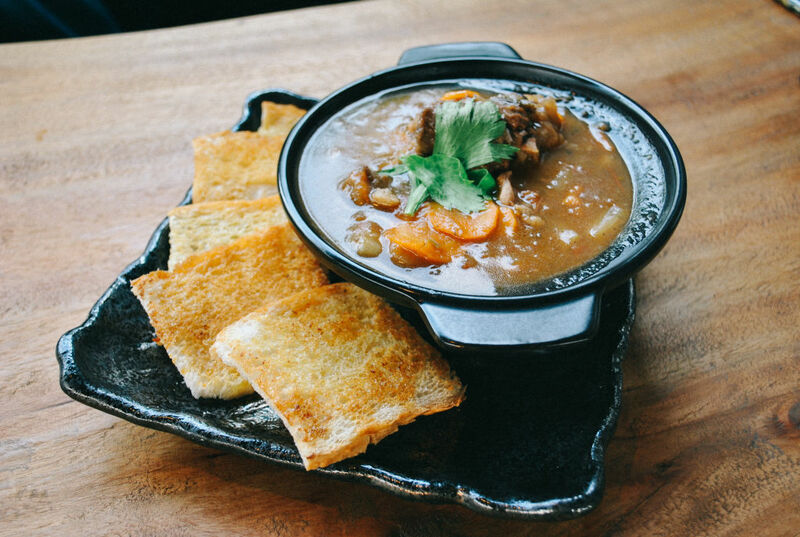 Our ultimate favourite: Oxtail Stew. This is one dish that is so difficult to master because it requires slow braising and getting the meat to be tender yet not too limp. Cooked with potatoes, carrots and popular asian spices, the stew is served with crisp garlic bread slices. The flavour is very rich, with the different ingredients adding to the texture of each mouthful taken. We liked that the broth was not too thick as well – making it easy to savour and sip. Having it with garlic bread is a smart combination too, as the garlic enhanced the broth’s taste. We will say that this is a must try dish, and only a few servings are being made every day! And being known for their Asian cocktails, we decided to try 7th Beauty as well as Rustic Sky. These are two of a list of cocktails made with Asian ingredients such as the chili padi, dragon fruit, lime-infused plums as well as Chinese dates. The result is that the drinks did not leave us with bitter aftertastes but still gave us the refreshing, extra punch in flavour together with the alcohol. They were smooth to drink and easy on the throat, though a slight burn comes with Rustic Sky. This is an invited tasting. Thank you to Lin Rooftop Bar and Insurgence for their hospitality. Photographs credit to Darren ‘Merovign’ Tan.